We are manufacturer of Labtro ultrasonic cleaner, ultrasonic bath, ultrasonic manufacturer in the India, ultrasonic cleaning system, Digital ultrasonic cleaner, Ultrasonic Cleaning Equipments, Multistage Cleaning Systems, Single or Multistage Vapour Degreaser, Ultrasonic Power Generator, Ultrasonic Transducer, ultrasonic flaw detectors, cleaning chemicals manufacturer, ultrasonic processors exporter. We are export from India. We are produced Ultrasonic Cleaning System ultrasonic cleaner, ultrasonic bath, ultrasonic manufacturer in the India, ultrasonic cleaning system, Digital ultrasonic cleaner, ultrasonic flaw detectors, cleaning chemicals manufacturer, ultrasonic processors exporter Electrical Energy from a transistorized oscillator circuit is fed to the transducers. These piezoelectric transducers convert electrical oscillations to corresponding mechanical vibrations and cause the tank bottom to vibrate, Labtro Ultrasonic Cleaning System, Ultrasonic cleaner, resulting in intense agitation of the liquid contained in the tank. This intense disturbance in the liquid contained in the tank will cause to form and collapse of millions of microscopic cavities or voids known as cavitations. When these cavities collapse or implode they release tremendous energy and produce an intense local scrubbing action on the objects immersed in the liquid, for cleaning. 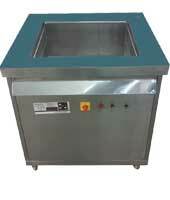 There are following types of Labtro ultrasonic cleaning system available here. Labtro's Results in efficient cleaning of metal, plastic, ceramic, alloys etc. Labtro Greater efficiency with high intensity cleaning. We are manufacturer of Labtro ultrasonic cleaner, ultrasonic bath, ultrasonic manufacturer in the India, ultrasonic cleaning system, Digital ultrasonic cleaner, Ultrasonic Cleaning Equipments, Multistage Cleaning Systems, Single or Multistage Vapour Degreaser, Ultrasonic Power Generator, Ultrasonic Transducer, ultrasonic flaw detectors, cleaning chemicals manufacturer, ultrasonic processors exporter. We are export from India..
Labtro manufacturer Ultrasonic Cleaners Highly demanded by various industrial and commercial places, our range of Labtro ultrasonic bath, ultrasonic manufacturer in the India, ultrasonic cleaning system, Digital ultrasonic cleaner, ultrasonic flaw detectors, cleaning chemicals manufacturer, ultrasonic processors exporter Ultrasonic Cleaners is supplied throughout the world. Labtro cleaners work on ultrasonic vibrations, as Labtro vibrations act as elastic waves at high frequency, propagated, in gaseous, liquid and solid normal. Labtro’s ranges of ultrasonic waves are above audible frequency 20 KHz. The Labtro's output should be controllable over a certain range. The Labtro's generator output voltage curve should not contain higher harmonics. The Labtro's generator should be small, cheap, reliable and easy to operate. Labtro Ultrasonic Cleaning by Labtro ultrasonic promotes extremely high degree of soil removal at quickly rate compared to other conventional method of cleaning, Digital ultrasonic cleaner, ultrasonic flaw detectors, cleaning chemicals manufacturer, ultrasonic processors exporter can penetrate into the most intricate and inaccessible areas where other methods of cleaning fail. 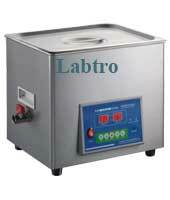 Labtro’s ultrasonic cleaner used for cleaning any product. Labtro Ultrasonic Cleaner has manufactured ultrasonic cleaning systems for a wide variety of applications and processes. Automated, multi stage systems used in the aerospace, defense, hospital and nuclear industries to validated HTM compliant irrigated machines for surgical instrument decontamination and bench top baths for tattoo and podiatry, Labtro’s Ultrasonic Cleaner can be designed to meet any type requirement. Most Delicate Mechanism or Components like Watch Parts, Jewellery, and Lenses Etc. It's Equally Efficient for Cleaning of Metals, Glass, and And Ceramics. Labtro Ultrasonic Cleaner is designed to deliver quickly and most effective industrial cleaning ultrasonic cleaner, ultrasonic bath, ultrasonic manufacturer in the India, ultrasonic cleaning system, Digital ultrasonic cleaner, ultrasonic flaw detectors, cleaning chemicals manufacturer, ultrasonic processors exporter. Labtro cleaning process is based on using cavitation bubbles to penetrate blind holes, cracks and recesses. This allows thorough removal of tightly adhering or embedded particles from solid surfaces. In these cleaners, water or other solvents may be used, depending on the type of infestation as well as the work piece. Labtro High Power Ultrasonic Cleaning. Single tank for multi chemicals cleaning, ultrasonic cleaner, ultrasonic bath, ultrasonic manufacturer in the India, ultrasonic cleaning system, Digital ultrasonic cleaner, ultrasonic flaw detectors, cleaning chemicals manufacturer, ultrasonic processors exporter anti rusting, rinsing and hot air drying. Circulation system for cleaning inner sides of Hollow components. Fully automated process control with variable process time selections for individual chemicals/rinses. 100% consistent cleaning process. Our range of Labtro Ultrasonic Cleaning Equipments works on piezo electricity and so the crystals being used are called as piezoelectric crystal. Mainly ceramics (lead zircon ate) crystals are used in Labtro ultrasonic cleaners, cleaner, ultrasonic bath, ultrasonic manufacturer in the India, ultrasonic cleaning system, Digital ultrasonic cleaner, ultrasonic flaw detectors, cleaning chemicals manufacturer, ultrasonic processors exporter. It is composed of barium, lead, titanium and zirconium. As crystals become thinner its capacitance rises and its impedance falls. It's impedance is 150-ohm/sq. cm. It's can be easily machined to desired shape. It's curie temperature is well above 300deg. /cm. We are manufacturer of Labtro Probe Snicator with sound proof Enclosure, ultrasonic cleaner, ultrasonic bath, ultrasonic manufacturer in the India, ultrasonic cleaning system, Digital ultrasonic cleaner, Ultrasonic Cleaning Equipments, Multistage Cleaning Systems, Single or Multistage Vapour Degreaser, Ultrasonic Power Generator, Ultrasonic Transducer, ultrasonic flaw detectors, cleaning chemicals manufacturer, ultrasonic processors exporter. We are export from India. Labtro Probe Snicator with sound proof Enclosure, Laboratory Probe Snicator with sound proof Enclosure, Ultrasonic Cleaner is designed to deliver quickly and most effective industrial cleaning ultrasonic cleaner, ultrasonic bath, ultrasonic manufacturer in the India, ultrasonic cleaning system, Digital ultrasonic cleaner, ultrasonic flaw detectors, cleaning chemicals manufacturer, ultrasonic processors exporter. Labtro cleaning process is based on using cavitation bubbles to penetrate blind holes, cracks and recesses. This allows thorough removal of tightly adhering or embedded particles from solid surfaces. In these cleaners, water or other solvents may be used, depending on the type of infestation as well as the work piece. We provide ultrasonic Probe Sonicator with the principal of ultrasonic cleaner. It is a high frequency electrical energy that is converted into ultrasound waves by means of ultrasonic transducers, which are bonded on the base of S.S. water tank. The ultrasonic Probe sonicator are high frequency sound less waves that are created in the liquid countless, microscopic vacuum bubbles, which rapidly expand & collapse. This phenomenon is cavitations. The bubbles act like miniature high speed brushes, driving the liquid into all openings and minutes recesses of the object immersed in the liquid. Excessive scrubbing of cavitation cleans away all the dirt and soil from the object immersed and the object is effectively cleaned. An intricate object can also be completely cleaned or by little dismanting. Microprocessor Controlled and Completely Programmable. Digital LCD display with time setting. Auto-tuning for convenience and optimal processing efficiency. Can be used to smash animal and plant cells. Labtro Digital Direct Reading Rotational Viscometer Labtro LRDV series is Rotational Digital Direct Reading Viscometer to measure absolute viscosity of Newton Liquids as well apparent viscosity of non – Newton liquid featured by high flexibility reliable Test result, easy operation and good appearance. 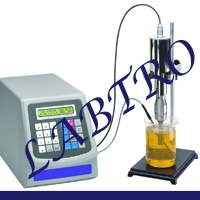 Labtro Digital Rotational Viscometer, Laboratory Viscometer, Scientific Viscometer continuous sensing capability for rapid viscosity measurement makes this economical digital viscometer a standout. Labtro Digital Rotational Viscometer, Laboratory Viscometer, Scientific Viscometer Measures viscosity and temperature simultaneously (with an optional temperature probe). With its timed measurement function, data can easily be sent to a PC or printer. Optional software allows the DV-I Prime to collect, analyze and record test data. 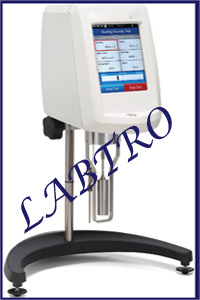 Labtro Laboratory Viscometer Digital Rotational Viscometer complete with stand and spindle set direct display of viscosity in centipoises or millipascal/seconds,%torque, spindle number and speed (18 speeds 0.3-100RPM). Compete with set of spindles for low or medium viscosity. Complete with hard caring case. Measures viscosities of dye solutions, pastes, sizing compounds, lubricants or adhesives.